Well, I had all these letters ready to go on my website last week and then the election happened. And then I tried to write a post about the election and it was a train wreck. It’s just been one of those weeks where instead of putting things on the internet and adding to the noise, I needed to listen. So I spent the week listening to (and reading) the voices of the people whose hearts were broken by the election results. And also a few whose were not. 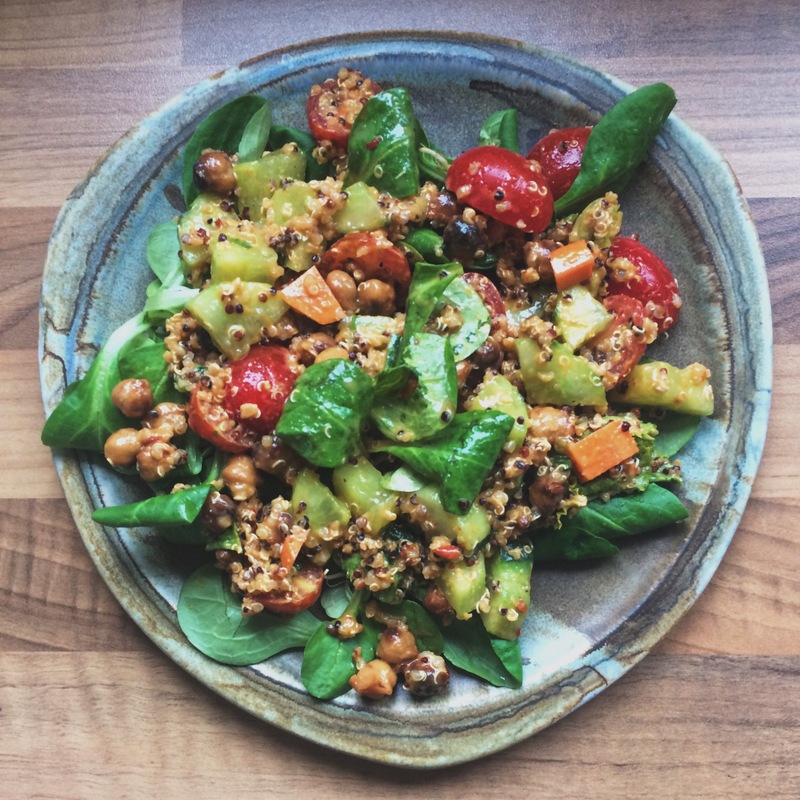 So this week, I am starting fresh with eating clean and trying to write again and that’s why I’m writing you a letter about a quinoa chickpea salad. You see I’ve been making this salad a lot lately that I keep meaning to tell you about. Because I think you should make it at Blackberry for your Market Sides Case. As in full of protein and fills you up in a way that gets you through your day. It sticks to your bones. Also, bonus! It’s gluten free. Well, at least I think it is. I can’t read all the ingredients in my bottle of chili garlic sauce. Honestly it’s a miracle I was able to translate enough labels to find chili garlic sauce in Germany. But you can study the labels of chili garlic sauce here to determine if it’s clean. 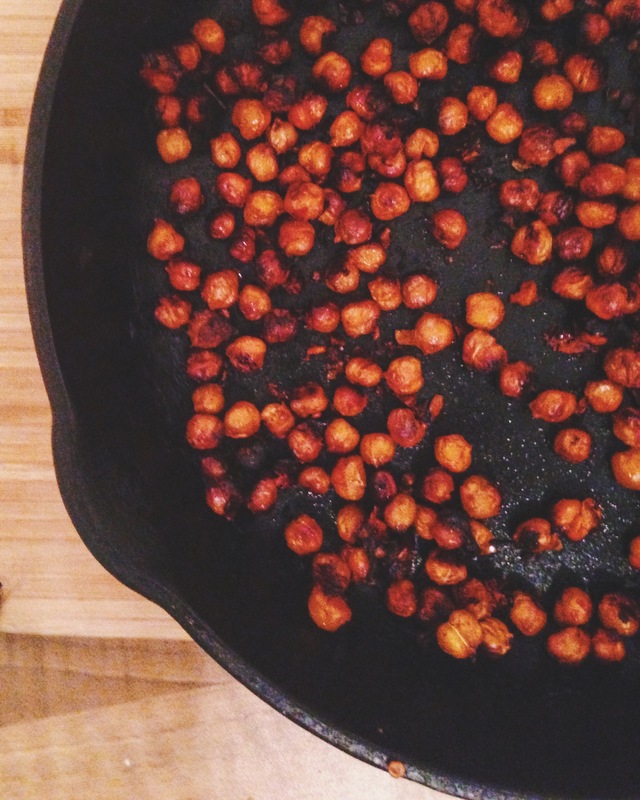 So, first you coat chickpeas in sesame oil and garlic chili sauce and then roast them. I like them to get really done, like crunchy, but you could cook them for a little less time if you wanted. Then you chop up all the vegetables and make a salad dressing out of peanut butter, more sesame oil and more chili garlic sauce. Add some honey or maple syrup and a little lime juice. Then BAM! This salad sings with flavor. It’s the goods. I promise. Make it and tell me what you think. I promise to get out of bed and stop reading Twitter if you do. Coat chickpeas with 2 tablespoons sesame oil, 1 teaspoon chili garlic sauce and a squeeze of honey. Roast in a 400 degree oven for about 15-20 minutes, stirring every ten. 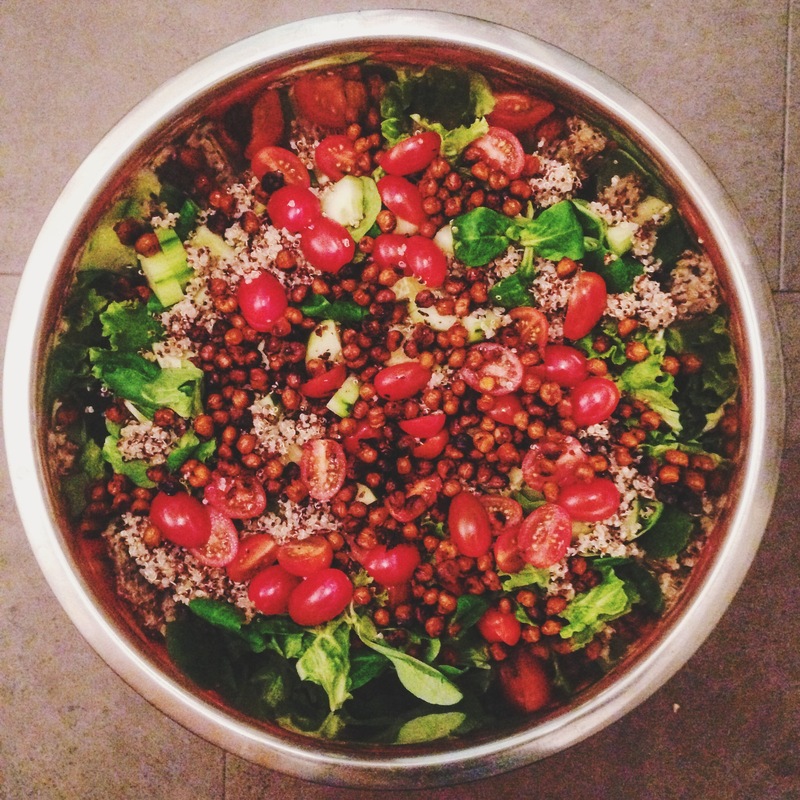 Place all salad ingredients in a large bowl and mix dressing ingredients with a stick blender. 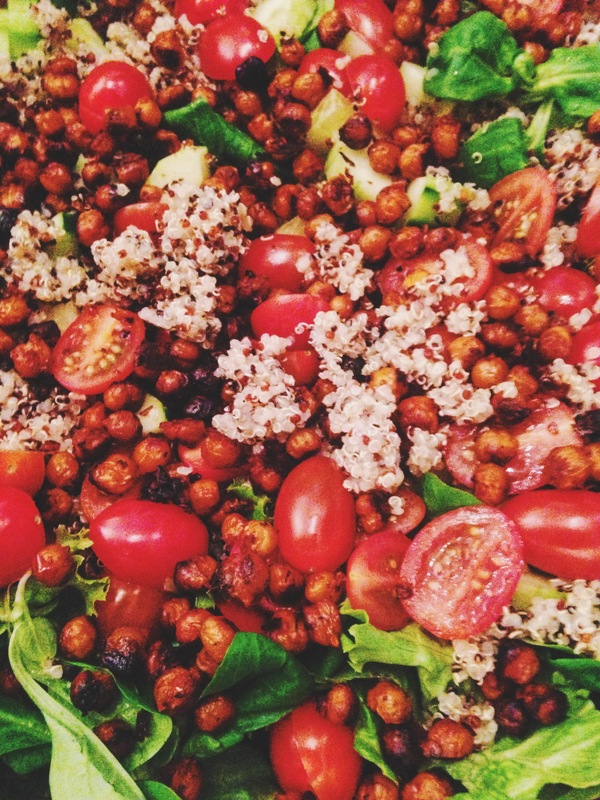 Add chickpeas to the salad along with the dressing and toss until entire salad is evenly coated. Serve immediately or package up for lunch power bowls!